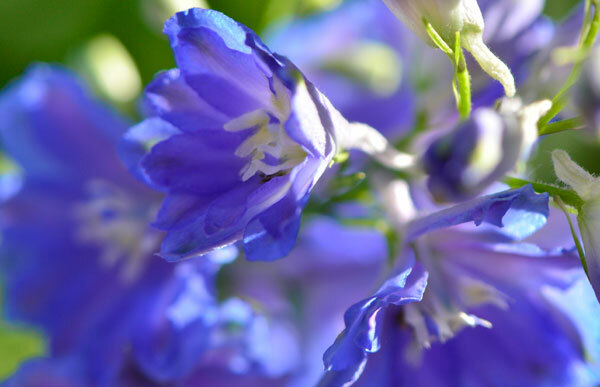 Daily, I recognize the difference between gardening exclusively with perennials – and not buying annuals like crazy. Although there’s less color overall, one is forced to pay closer attention to empty color spots, so as to better plan for next year. Each year builds on the previous one. Besides, it teaches one patience. Move on, no instant gratification here, Mary. I’ve almost finished mulching. The hill above the garden by the bamboo fence and the trees in the backyard will be the last to get done. It’s a difficult haul that I totally dread. Tomorrow I’m buying vinegar and Epsom salts to spray the weeds in the drive in advance of the gravel that’s arriving on Wednesday. I must admit, I love killing weeds. I used the vinegar/Epsom/soap blend last year and it did a good job. (You’ll need a sprayer) However, you can only do so much without a fresh load of gravel! 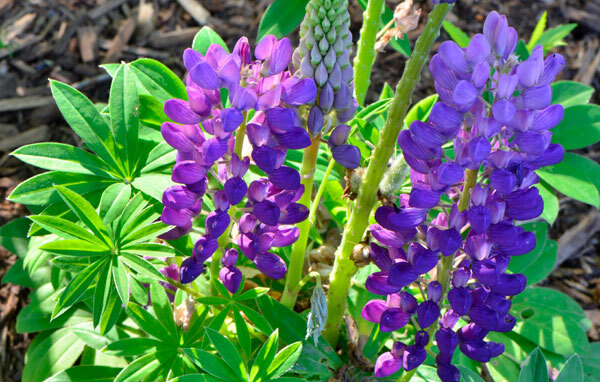 Lupine flowers are delightfully long blooming. Note to self: Buy more for next year. Check out what’s in the garden now. 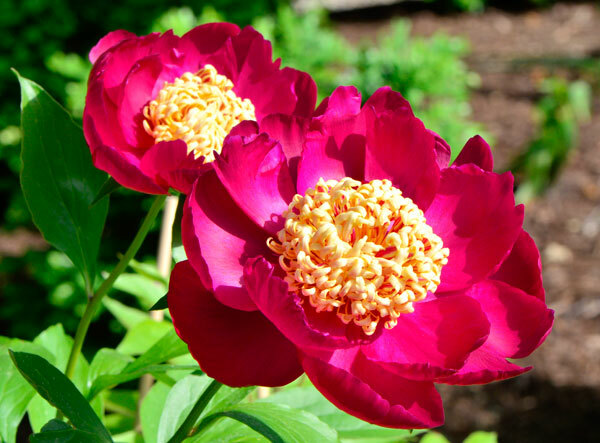 Last year I bought a couple new peonies at Cricket Hill, the local “go to” for gorgeous peonies. 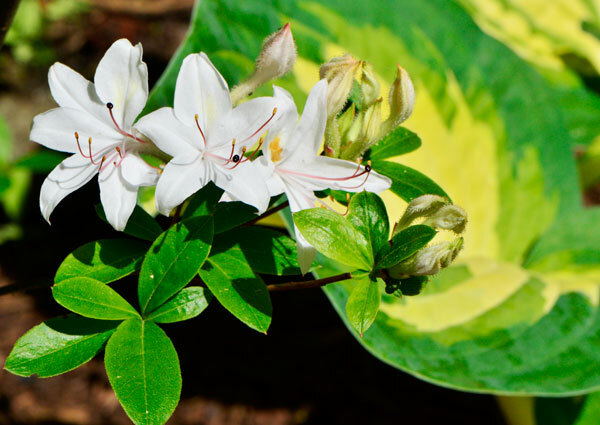 It’s time to introduce fertilizer and see how to avoid pests that like them. 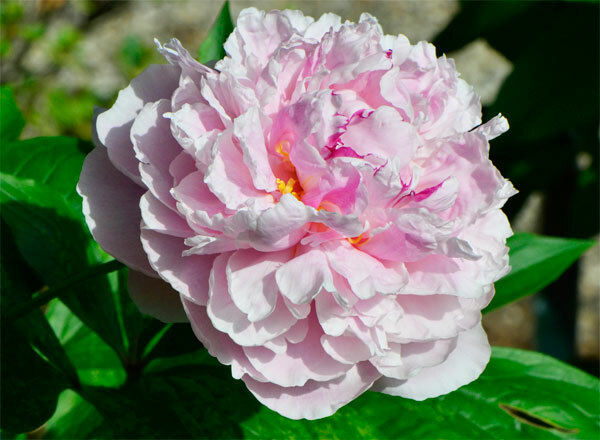 It made not be the MOST fantastic peony (although close) BUT- what a divine scent! The song Train Home, has been running through my head since I heard it a couple weeks ago. Chris Smither is basically a folksinger- song writer. Love this song. There’s an intimacy to it that I find comforting. What do you think? Train Home. A welcome late blooming azalea from Maine. This one has a spicy smell to it that’s quite unique. I often wonder who’s writing folk music now. For OUR times. Sometimes, you can hear new folk music from young performers in Austin, TX, or from bluegrass and country singers. Like lots of other popular music though, the performance has become “the thing” rather than content. Did you ever wonder the origin of folk music? Another name for it is roots music- I found this interesting site about its genesis in America. Check out a new scarf design I’m testing. (Coming soon for sale on this site). 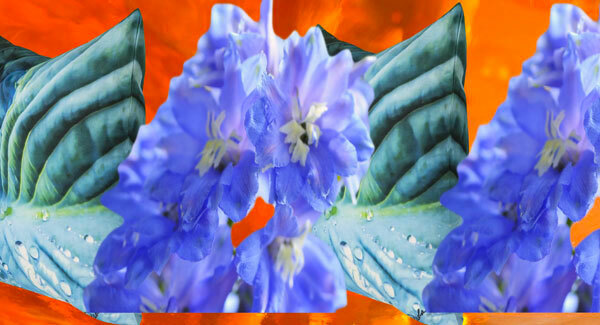 All the images I use in my scarves and pillows are from my gardens. The black patterned ends are from the center of a beautiful sunflower I raised from seed. Long gone, but new sunflowers are on the way this year! I’ve been selling these three designs for a month now. Guess which one is the best seller! What’s your favorite? Aquilina and Ancienne- Blissfully soft and beautiful conversation pieces for your home. 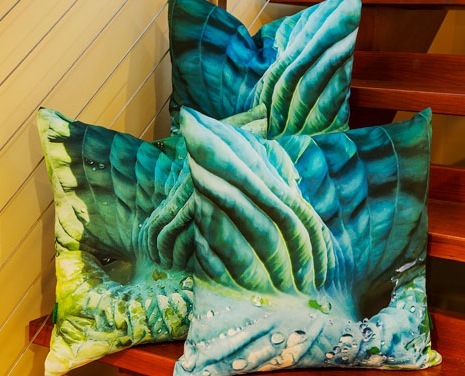 Paola Pillows are in stock and will ease your mind about not having an outdoor garden. What do you think about a flower garden on your couch, rain or shine? And no weeding!